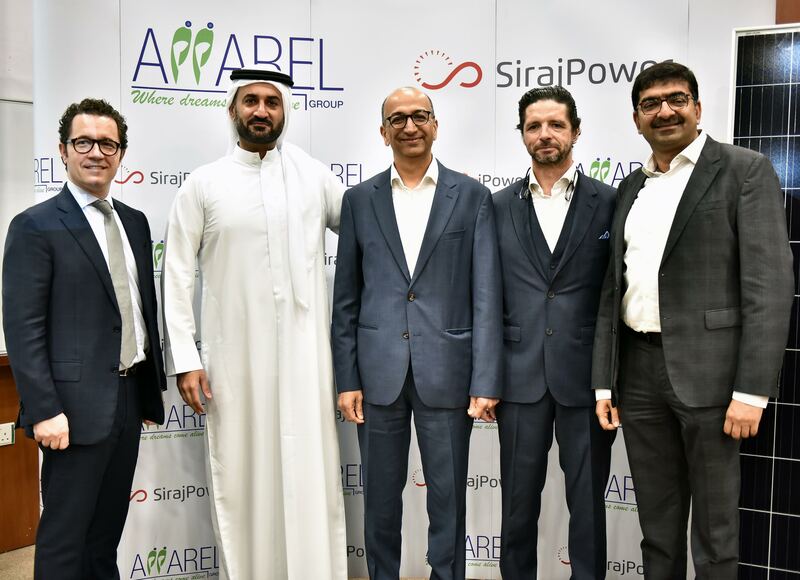 Apparel Group, the region’s leading retailer, today celebrated the launch of its solar plant at its warehouse facilities in partnership with SirajPower, the UAE’s leading provider of solar roof. To mark the occasion, an inaugural ceremony was held with the attendance of Mr Nilesh Ved, Chairman at Apparel Group, senior leadership from SirajPower including Mohammed Abdulghaffar Hussain, Chairman and Laurent Longuet, CEO, as well as other VIPs. The 2 MWp solar plants installed at two of Apparel Group’s warehouses in Jebel Ali Free Zone (JAFZA) are expected to cover more than 55% of the company’s electricity consumption, saving 2,121 metric tons of CO2 during the first year of operation. The annual savings with this initiative would be equivalent to taking 450 cars off the roads and is part of Apparel Group’s CSR initiative towards sustainability for a better tomorrow. SirajPower has already inked several agreements within the last few years with prominent UAE businesses. To date, it has secured 50MWp leasing scheme across the UAE, including the installation, financing and operation of the two Apparel’s warehouses PV systems. SirajPower became the market leader in distributed solar energy and is now well positioned to increase its portfolio in 2019 in the UAE and beyond. The company is already in negotiations for other projects with total capacity of approximately 100 MWp. An ardent believer in sustainability, Apparel Group launched the region’s first cardless loyalty programme eliminating more than 2.3 million plastic cards and associated packaging material. Apparel Group’s state-of-the-art 24×7 automated distribution center set up to support omni-channel distribution, is designed according to LEED Green Building guidelines, a testament to imbibing a culture of sustainable operations. Another major initiative launched recently includes eliminating over 1 million single-use plastic bottles by replacing them with reusable water bottles for employees.